I love being surprised by books and The Selection by Kiera Cass did just that! 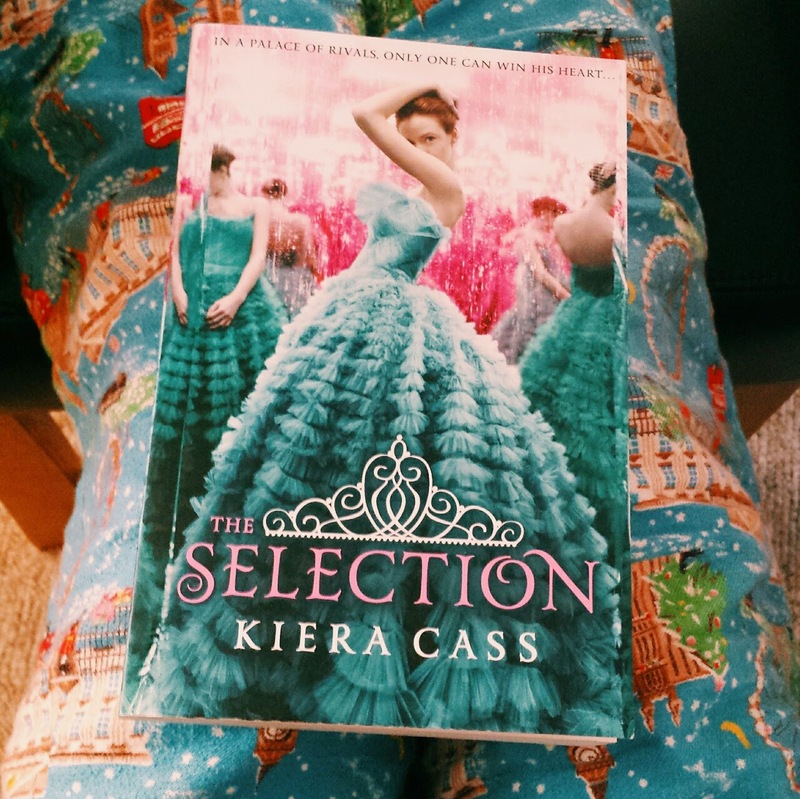 The Selection is a light, addictive and girly read that is set in a dystopian future, where people are divided into classes, number ones, royalty, being the most well off, and number eights being the worst off. The protagonist America, is a Five. Her family is barely managing to get by when it’s announced that Prince Maxon is looking for a bride. America enters The Selection, similar to the show The Bachelor, except the prize is a prince! America isn’t entering for the prince’s affections though, in fact she can’t stand the sight of him, but she’s doing it to help her family. When she meets the Prince however, she finds he’s nothing like she imagined and she might be in it for more than the money. The Selection has been one of those books that I had always seen people reading around the book community, but the cover had never really enticed me to read it. You know that old saying ‘never judge a book by it’s cover’? That applies to The Selection. It was not at all what I was expecting. I’d seen all the Hunger Games comparisons, but I’d rubbished them because honestly, I thought this was going to be some silly, fluffy book. But it wasn’t. I was pleasantly surprised to see that it was dystopian fiction. The book centers on the reality TV style competition to win Prince Maxon’s heart, but the subplot of the rebels was interesting. They were definitely looking for something inside the castle, perhaps the next book will reveal the answers. This novel was both predictable, but a few twists and turns kept me on my toes. We obviously know that America will change her preconceptions of Maxon and while he did first appear like a completely stuck up snob, he redeemed himself and I managed to fall in love with him instantly unlike America whose heart is torn between the Prince who can provide and give her a life of luxury and the boy back home in the lower caste, Aspen. On several occasions, I found myself inwardly screaming at America to choose Maxon, but I won’t know until I get my hands on the next book, The Elite, to see if she listened to me. That brings to my next point – Cliffhangers! I was aware while I was towards the end that there was no way this book would be summed up nicely with all questions answered in a definite ending. It leaves you rather suddenly and it left me wanting to take the bus all the way to town so I could get my hands on The Elite right away, even though it was 4am. I need answers. Finally, I think if you can get past the first few slow moving chapters that are bogged down with setting the story and giving you all the relevant information then I think that this makes for an exciting read. Also, some of the character names are rather silly. Personally, I didn’t like the name America for the protagonist at all. There are going to be characters that you love and are sweet as sugar. However, there are going to be characters *cough* Celeste *cough that are just rotten. This book was a complete gem that I gradually fell in love with. It’s not the fluffy, chick-lit that I had originally believed it was. Yes, there’s romance. However, it’s got elements of science fiction and war etc. It’s beautiful, compelling and I can’t wait to find out what happens to Maxon, America and co in the next book.